What Would You Do With $600B In Cash? I wrote last year about the broad, secular shift to online food ordering, and the significant capital inflows into the space that we were seeing. Fast-forward a year, and we’re now looking at a very different funding environment. 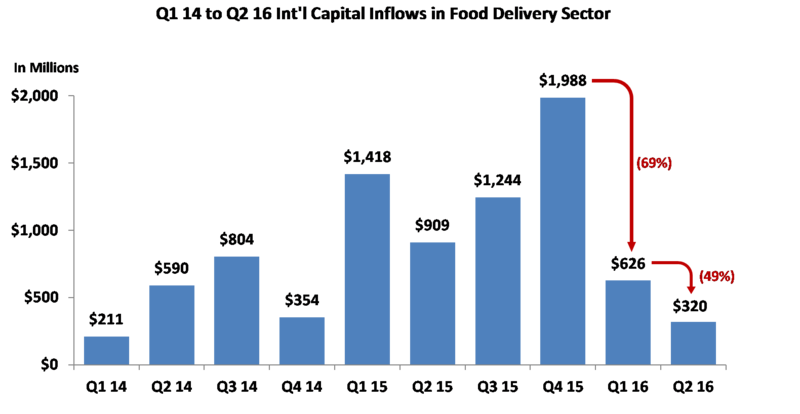 According to research firm CB Insights, international inflows of capital to the food delivery category dropped 69 percent in Q1 ’16, and then dropped another 49 percent in Q2 ’16. 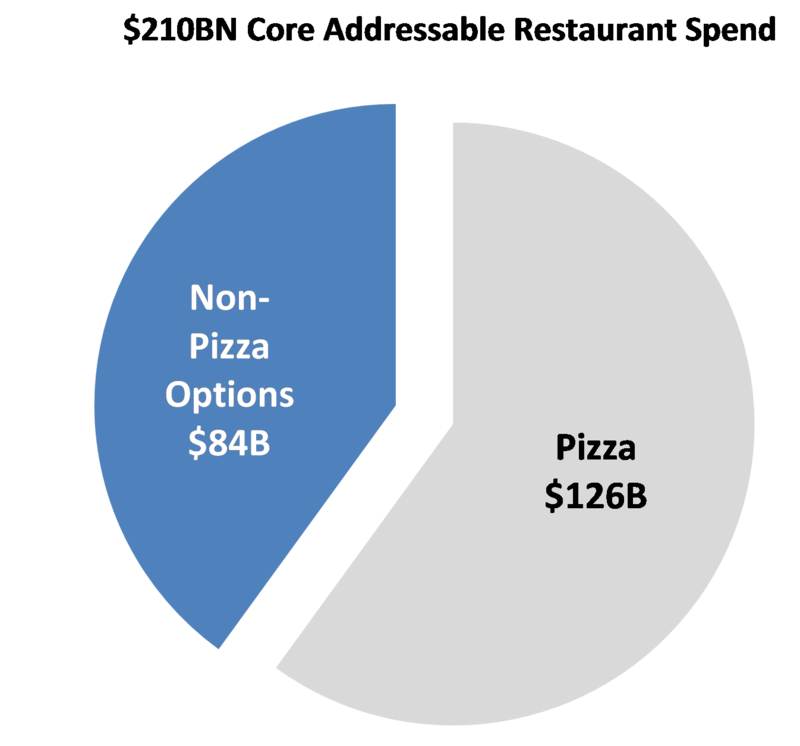 A statistic that is less often discussed is that an estimated 60 percent of this $210 billion addressable market is attributed to pizza. While this may be an interesting data point on its own, an AlphaWise survey conducted in April of this year points to the fact that consumers want more than just pizza as a delivery option. 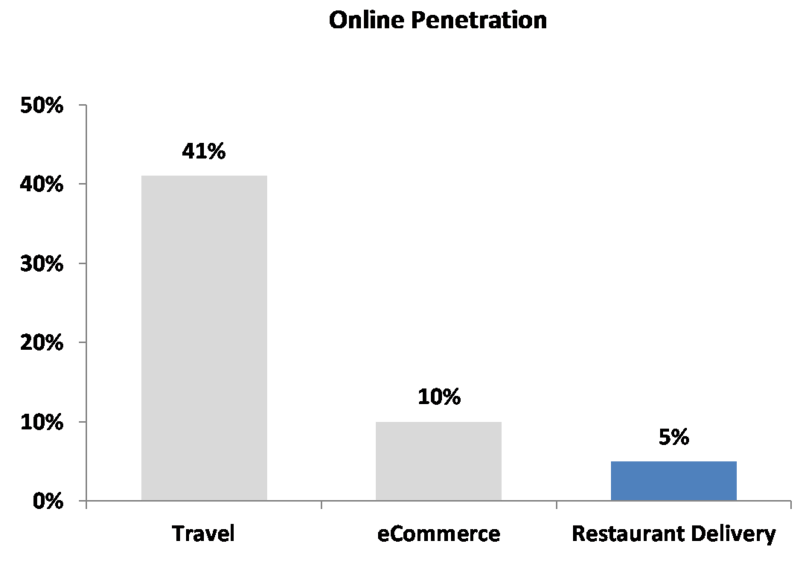 In their survey of more than 5,000 American consumers, nearly two-thirds of the respondents placed take-out orders from restaurants during the prior six months; take-out orders which could have easily been delivery orders had delivery been available for options other than pizza. The survey went on to further show that these increasing levels of demand were consistent “across urban, suburban and rural markets” (Morgan Stanley Research: Restaurants and U.S. Internet; AlphaWise April 2016 Survey). And as online food delivery services continue to rapidly expand, more and more previously undeliverable restaurants are now becoming easily accessible for delivery. What all this means is that the $126 billion piece of the pie that was historically the domain of pizza is now quickly becoming up for grabs. Let’s not forget that this considerable $210 billion market opportunity is not a static figure. If consumers as a whole begin spending less time dining out at restaurants, and more time ordering in, the entire pie expands. In fact, The NPD Group, a market research firm, is forecasting that off-premise food service will outpace overall restaurant industry traffic growth over the next decade. 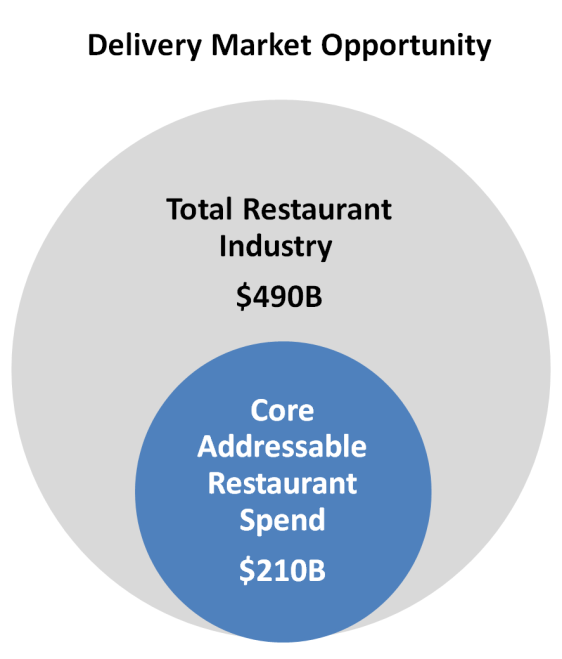 If we look at the restaurant industry broadly, which makes up a $490 billion market, the food delivery opportunity equates to just 43 percent. Looking at it from this angle, more than half of this market technically remains open to be pursued, where even a single percentage expands the delivery market opportunity by nearly $5 billion (Wall Street Research Reports). All that being said, with so much noise out there in the media, it’s quite easy to overlook this added perspective. One must not forget that secular trends occur over a long-term time frame — often over quite a number of up-and-down investment cycles. And through these cycles, companies will rise and fall like they always have throughout history. The important thing to remember is that broad, secular shifts, while infrequent in occurrence, present extraordinary opportunities for those fortunate enough to capitalize on them.